Are you looking for an efficient way to stay organized and reduce the clutter in your office or home office? If that is the case, you will need an L-shaped office desk. Such a table doesn’t consume a lot of office space, yet it provides you with ample working space so that you can reduce the clutter in your office. In addition to that, the desk allows you to stay organized so that it is easy to locate everything you need while playing games or working. Owing to the variety of these desks on the market, I will help you to narrow down to the top 10 best modern L-shaped desk. Do not go further since these desks combine style, function, durability, and convenience in one unit. Give a modern look to your working environment by adding Bestar modern L-Shape desk. It is made using a durable 0.75″ commercial grade work surface that features a melamine finish so that it can resist scratches, wear, and stains. Apart from that, the desk features two shelves one of which that is adjustable, and a file drawer that features a letter and legal filing system to assure you of enough storage space. The desk is a perfect addition to any modern office and a place you want to ensure a quiet working environment. This is due to the ball-bearing slides that hold the file drawer and the keyboard shelf to guarantee a quiet operation. Also, it is a great choice for small office spaces due to the compact design. In particular, the desk measures 30.1″ H x 59.5″ W x 45.8″ D while it weighs 149lbs. It comes in Tudexo finish, white, and secret maple. Get additional space to work without making your office space look clunky by adding this corner desk. The desk measures 59(L) x 55(W) x 29.5(H) inches while it weighs 60lbs. Its middle is curved to allow it to bend in an “L” shape. Since it features an edgy architectural design, you can be sure that it will provide an elegant and crisp look that will support all items placed on it. Apart from that, the desk is made using a sturdy, steel frame that enables it to support all items placed on it. With it, you can be sure to add a classy and modern look to any home office area since it features a classy wood top design. Also, the desk features a slide-out keyboard drawer that enables it to remain stylish. It comes with the required tools and instructions that make it easy to assemble. Create a multifunctional work area by fitting Zinus L-shaped corner desk in a corner or against the wall. The desk features an L-shape design with a wide desktop so that you can get sufficient work space. On top of that, it features two shelves that allow you to get a convenient storage. 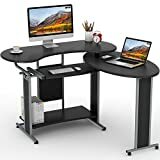 You can get it when looking for a durably constructed computer desk since it is made using sturdy steel frames and legs. The desk measures 53 x 49 x 28.9 inches while it weighs 66pounds. Add a contemporary style to your office by adding Whalen computer desk. The desk features a large L-shaped desk area so that you can be sure to have enough working space. 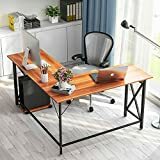 More to that, it features curved solid wood legs that are strengthened with metal supports to assure you of getting a durably-constructed office desk. You can get this desk when looking for one that is easy to clean, thanks to the black tempered glass worktop. A perfect combination of durability, function, and design is Monarch Specialties Computer desk. The desk measures 71 x 71 x 30 inches while it weighs 139 pounds. It features two large storage drawers and a large file drawer to allow you to get enough storage to keep things organized. More to that, the desk features plenty of desktop surface so that you can get enough space for all working needs. You can get it when looking for a desk that is easy to assemble since the drawers can be assembled on the right or left sides. Also, the desk is a perfect choice when you want to add a stylish look to any office due to the sleek grey wood-look finish on all sides. Due to the sturdy metal track legs, you can get it when looking for a sturdy yet easy to clean L-Shaped desk. One of the best modern L-shaped desks that will make a perfect addition to small offices and bedrooms is Little Tree L-Shaped Corner Desk. The desk can accommodate two 27″ monitors, a printer, keyboard, and gaming system. On top of that, it can hold a computer CPU using the integrated CPU stand. You can get this desk when looking for a durably constructed desk due to the sturdy and durable X-shape frame. Also, the desk is a perfect choice when you want to add a stylish look to any office due to the blending sleek elegance design. Improve your home or office environment with HOMCOM 64″ Modern L-Shaped desk. The desk features a powder-coated steel frame and a long-lasting MDF material to assure you of getting a stable office desk. On top of that, it features a contemporary design so that it can add a modern look to any office. With it, you can be sure to have a convenient computer desk due to the slide-out tray that slides back and forth and remains concealed when not in use. Whats more is that it is easy to store and transport due to the detached computer tower cart on the smooth rolling wheels that make it easy to transport. Another computer desk from Little Tree is this sturdy workstation table. It is made using a steel frame while it features a rugged and reliable design so that you can be sure of excellent stability. Whats more is that it features an L-shape corner design. 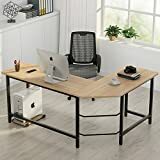 This assures you of getting plenty of space so that you can use it for computer work, writing, and home office activities. The desk features a free CPU stand that lets you organize your space. 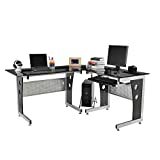 Once you get it, you can be sure to have a desk that is easy to assemble due to the M-style buckle design and the included instruction and tools. 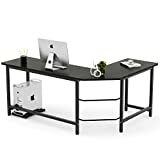 Whether you are in need of sufficient space for studying, writing, computer work, or home office activities, then you can be sure that this desk will provide adequate space for that. The reason is the wide desktop that is durable and smooth so that you can be sure of getting ample working space. The desk is made using high-quality artificial boards while it features sturdy steel legs to assure you of a durable workstation. With it, you can be sure to have a healthy and environmental-friendly workspace due to the E1 environmental protection board. 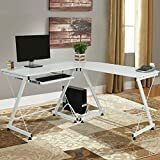 Also, the desk assures you of getting an easy to install desk since it features a flexible configuration that allows you to assemble the L shape on the right or left side. Taking the lead in this review is Tribesigns Modern L-Shaped Desk. It comes with a free CPU stand that allows you to remain organized. On top of that, the desk comes with the tools and instructions required during installation, while it features an M-style buckle design to assure you of ease of installation. You can get the desk when looking for one that is safe to use in any office due to the E1-class environment protection particle board that assures you of safety. 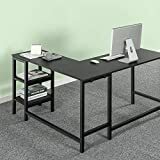 Also, the desk is a perfect choice when looking for one that is built to last since it features a steel frame and steel legs. The products reviewed above are the best corner shaped tables available on the market. The desks feature a durable and stylish design, while they are designed to provide you with ample working space so that you can be sure to work conveniently. Try them today and be sure to have spent your cash on the best modern L-shaped desks available on the market.